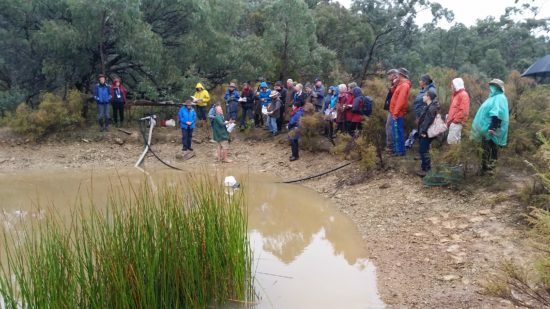 Wetland ecologist, Damien Cook presented the Turning Your Dam into Habitat workshop on Friday the 21st of April 2017 on his property in Spring Gully. Participants heard about the possibilities and practical steps for turning farm dams into habitat, wetland ecology and managing soil erosion in ephemeral creek lines. Damien started the day talking about a swale that he and partner Elaine Bayes had built to divert water away from the house. This swale helps prevent water gushing in their front door and provides habitat for animals by remaining moist when nearby areas have dried out in times of less rain. We also heard how it acts as a biofilter and helps with mitigating soil runoff in times of high rain. Damien kicks off the workshop by talking nutrient cycling and inviting frogs with things they like. Next we moved to a small frog pond near the house. This pond had previously been the site of a driveway but had been renovated to encourage frogs and provide space for wetland plants. Here Damien talked about encouraging insects as prey for frogs and fish and about nutrient cycling that occurs with wet and drying conditions. Plant species in this pond include Swamp Wallaby Grass (Amphibromus fluitans), Common Swamp Wallaby-grass (Amphibromus nervosus), Ridged Water-milfoil (Myriophyllum porcatum) and Water Ribbon (Cycnogeton procerum). Damien recounted hearing five different species of frog using this small pond. When asked if he had introduced the frogs, he responded that “no, I invited them by providing conditions that frogs liked”. A short walk through the paddock included a quick stop to listen for and talk about the Biberon’s Brooding Frog, (Pseudophryne bibroni) whose unusual parenting habits include the stay at home dads looking after the fertilised eggs until rain comes and disperses his brood. Damien also pointed out that his paddock was home the Golden Sun Moth, another critically endangered species. 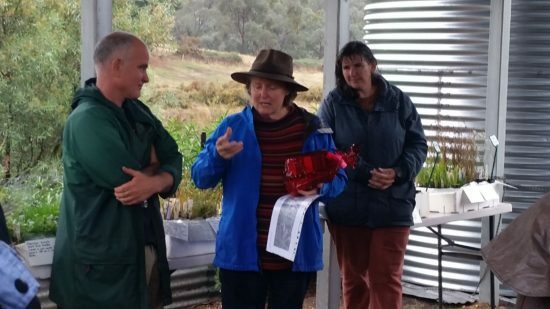 At the dig dam participants heard about the value of creating banks of topsoil to plant into. At the first of three dams on the property Damien explained that, as with most dams, it was constructed in a way that has ensured it’s surface was largely subsoil. Damien had therefore built up the banks with introduced top soil and planted Jointed Twig Rush (Baumea articulata) into them. He had also planted Old Man’s Weed (Centipeda cunninghamii) and Eel Grass (Vallisneria australis), the later being a delicious treat for the resident yabbie population. This dam provided an opportunity to talk about why it’s good not to have trees on dam walls, creating floating pontoons in deep dams, and making shallow areas and peninsulas if renovating or building a new dam. 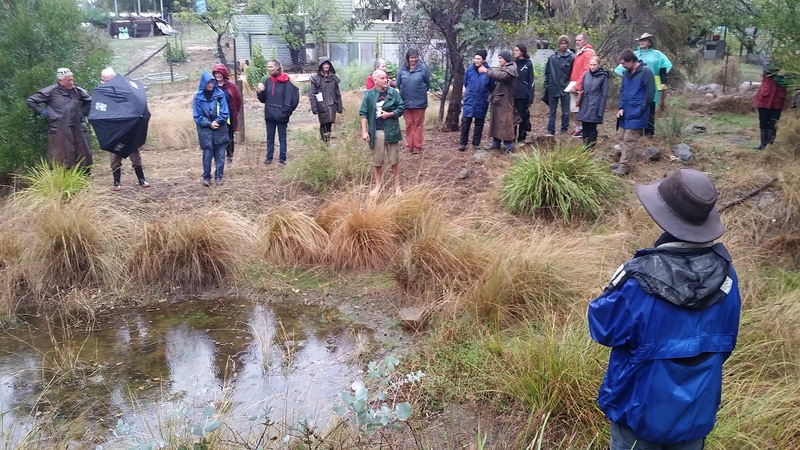 Our next stop was the medium sized dam which was near full and awaiting the Water Ribbon germinants to reach the surface thus mitigating evaporation and providing shelter for frogs in warmer months. Good questions from attendees helped draw out information from Damien about how to slow water down and make habitat in our landscape. The last stop was a small dammed area in an ephemeral creek line. Prior to the 2010-11 flood this area had been prone to erosion. Damien has renovated the area using rocks and wetland plants such as Tall sedge (Carex appressa) to mitigate the erosion from moving up the creek line. This has allowed the creek to back up behind the dam wall and a small pond to form. Participants shared the joy of walking through the revegetated area to the dam. We heard how the planting in the creek and on it’s banks had prevented the further erosion of the creek and have provided habitat for various creatures including butterflies, moths and frogs. Plants along the creek used for the revegetaion included Blackwood wattle (Acacia melanoxylon), Sweet Bursaria (Bursaria spinosa) and Gold Dust Wattle (Acacia acinacea). 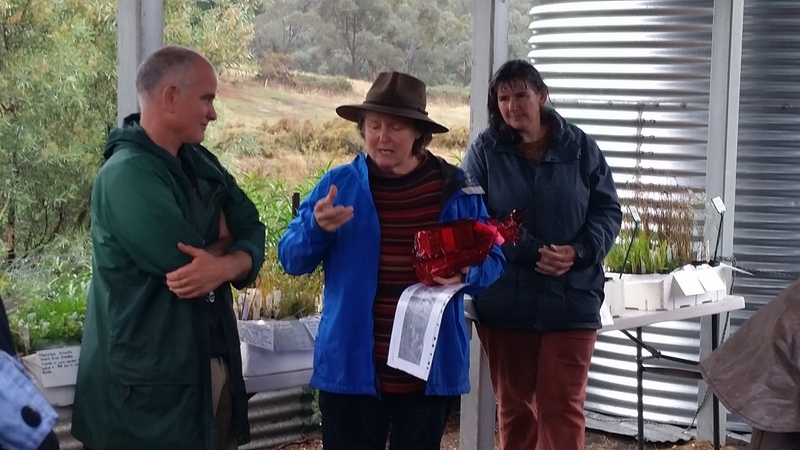 Committee Member, Deb Wardle sums up the workshop and presents Damien with a gift from Connecting Country. Finally, back under shelter, we heard from Frances Cincotta from Newstead Natives and Damien about some wetland plant specifics. Deb Wardle from the Connecting County Committee of Management concluded the session and thanked Damien and the attending audience for the information and persistence in spite of the rain. Thanks to all who attended, to Damien and Elaine of allowing us to host the workshop at their property and in particular to Damien for his informative presentation. 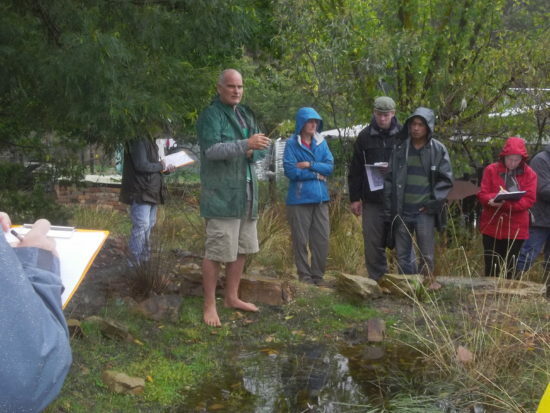 It was such a joy to hear how participants could reap the benefits of establishing more wetland plants and animals on their properties. The following is notes given to participants who attended the workshop. 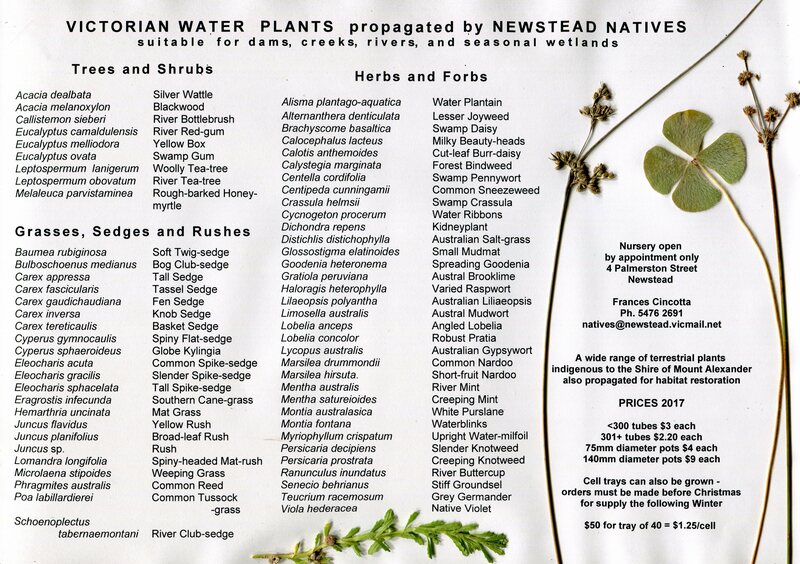 For a wetland plant list developed by Frances Cincotta from Newstead Natives click here. From the South West Slopes -Revegetation Guide here is Chapter 11 titled “Enhancing Farm Dams‘. It gives and a site plan with good hints for what to include as ideas for renovating your dam. It’s good to note that this chapter was developed for NSW and so some of the plant species recommended may not be appropriate for our area.